I know some bloggers/critics don’t want to waste their time reviewing books they don’t like when there are so many good books to talk about. Which makes perfect sense. But for me — and if you follow Reader@Large you already know this — I enjoy talking about books that aren’t exactly masterpieces. I think it comes out of my art school background. When visiting museums the works that excite me the most are the ones where the pencil lines are still visible under the paint. Or, even better, an incomplete study in an old sketchbook where the artist is working out ideas for his or her final piece. I’m also fascinated by the whole wabi-sabi home thing. Below is an excerpt from my review of Carla Guelfenbein’s In the Distance With You, which was published on the Los Angeles Review of Books site (August 31, 2018). The title of the piece, which I didn’t choose but still love, is Messy Human Beings: On “In the Distance With You”. The novel, itself, is a bit of a mess… but a delightfully well-crafted mess. Despite that (or maybe even because?) this is one of my favorites of all the reviews I’ve written over the years. THERE’S NO DENYING the thrill of a well-constructed book in which plot and characters move across the page in perfect synchronicity. Why, then, is it so often the messier books, riddled with inconsistencies and never reaching logical resolutions, which capture our imagination? Books that, intentionally or not, invite us to stick our fingers into plot holes and probe around, and that cause us to shake our heads in frustration at the incomprehensible choices of their authors. Those are the ones that stay with us, that we pick apart in our book clubs, that provide the endless fodder for heated discussions with other like-minded literary obsessives. Carla Guelfenbein’s In the Distance with You starts with a promising premise. An 80-year-old writer is discovered unconscious in her home, her half-naked body crumpled at the foot of the stairs. The obvious conclusion is that she tripped and fell. But Daniel, the friend and neighbor who finds her, believes she was pushed. He convinces the local authorities to open an inquiry and, at the same time, begins his own investigation into what happened. As he searches for answers, he compulsively carries on a one-sided conversation with her, at her bedside and in his head. Your hands were curled into claws, as if they’d been scratching invisible bodies before they surrendered. A pool of blood encircled your head. You also had a long scratch on one arm, a reddish streak that ran from your wrist to your elbow. Your nightgown was bunched up around your hips, and your pubis, smooth and white, showed between your open, elderly legs. I covered you as best I could with your nightgown. This is our undignified introduction to Vera Sigall, the fictional Chilean writer who spends the majority of Guelfenbein’s novel in a coma. She is modeled on the Brazilian writer Clarice Lispector (whom Guelfenbein has cited as a literary influence, along with Virginia Woolf), but could just as easily be based on any number of the 20th-century female artists — Georgia O’Keeffe, María Luisa Bombal, Agnes Martin, and Victoria and Silvina Ocampo — whose tumultuous lives and savage talent gained them cult-like followings in their lifetimes. This link, between Vera and her historical counterparts, is the lure. But though it is presented ostensibly as her story, Vera Sigall is merely the juncture at which other stories converge. Title: The Case of Lisandra P.
When writing #WITMonth posts, my first instinct is to spotlight only amazing books. And while those books definitely exist, it started to seem unfair to hold a writer to a ridiculously high standard because of her gender. It is perfectly acceptable for women, like men, to write mediocre but ultimately entertaining novels. Novels you take to the beach or read beside the pool not caring if the pages get full of sand or foxed from the water. Novels that are a little far-fetched and require a willingness to buy into coincidence after unlikely coincidence; but which have you locked to the page – frantic to find out what happens next. The Case of Lisandra P. is that kind of book. In 2003 the French military’s role in training Argentine forces thirty plus years prior, in both urban warfare and torture techniques, was revealed. That training was subsequently used by the Argentine government against its own people in what came to be known as the Dirty War. Anywhere between 7,000-30,000 men, women and children disappeared between 1974 and 1983 – no one knows the actual numbers – and devastated families had no choice but to accept never knowing what had happened to a generation of their loved ones. French writer Hélène Grémillon sets her story in Buenos Aires, 1987. It is against this backdrop of residual paranoia and loss which The Case of Lisandra P. plays out. When a beautiful young woman is found dead on the sidewalk by a pair of young lovers, six stories below the window of her own apartment, the police are more than happy to implicate the husband. But Dr. Vittorio Puig, psychoanalyst, maintains he is innocent. From prison he reaches out to one of his patients and asks for her help in uncovering the truth. Eva Maria, an alcoholic and emotionally fragile woman (who may be a little in love with Puig), hesitantly agrees. The alcoholic detective, recovering from a tragic past may be as cliché as it gets – but Eva Maria is more than that. She is a mother still reeling from the disappearance of her daughter. One day Stella left the house and, like so many others during the Dirty War, never came back. Her body was never found. In the aftermath, Eva Maria’s marriage falls apart and she drinks until she blacks out. Her remaining son’s attempts to reach out to her, to care for her, are continually rejected. He desperately wants some sign of his mother’s affection, but Eva Maria is buried alive in a very real portrayal of a parent’s inconsolable grief. …The funeral of a dead woman is one thing, but of a murdered woman, that’s something else entirely. The sorrow of not knowing how she died, this woman they are burying: it impedes mourning, and nothing should ever impede mourning, or there can be no healing. Can anyone here imagine Vittorio pushing his wife out the window? Is anyone here absolutely convinced he did? Eva Maria got there first, and she will be the first to leave. The policeman are waiting. Talking. Laughing. Eva Maria hides behind a tree. She watches as people leave the church. You don’t take photos at funerals. Her camera sounds like the song of a sick bird. She doesn’t want to miss anyone. Eva Maria is beginning to have a taste for suspicion, the stifling sensation that anyone could have killed Stella. She meant to say Lisandra. She’s confusing them. Mixing things up. In her mind now the two dead women are overlapping. The one who makes her suffer so much that she cannot bear to think of her, and the one who did not suffer, who occupies her thoughts for hours on end. As she becomes more involved the case the boundaries between Lisandra P.’s murder and Eva Maria’s obsession with her daughter’s disappearance begin to blur. As she listens to tapes of his sessions, at Vittorio’s request, she learns terrible secrets regarding her fellow patients. Things quickly spiral into an ending both shocking and tragic. Structurally, The Case of Lisandra P. is a hodge-podge that incorporates first person stream of conscious and all three third person narrative perspectives (objective, limited and omniscient) as it jumps from character to character. Even the victim gets her turn to speak. Four pages of sheet music are reproduced between chapters, we read directly from the transcripts of Puig’s therapy sessions, there is the illustration of a sign and of a business card, a list of words Lisandra found in a book takes up three pages. There’s probably more that I’ve forgotten. Grémillon has metaphorically dumped a box onto a table and assembled a novel out of the contents. A hot mess is one way to describe it. But the disorganization also creates the impression that the reader is actively participating in Eva Maria’s investigation. Hélène Grémillon’s first novel, The Confidant was nominated for the Prix Goncourt du Premier Roman and won Monaco’s Prince Pierre Literary Prize. I have to think that it was a very different book than this one. The Case of Lisandra P. is a perfect poolside thriller. Easily read and just as easily forgotten. Murder Most Serene is a study in contrasts. It is a tale of two cities, one above and one below, during the month and years preceding Napoleon’s invasion of the then Republic of Venice. The inhabitants, fully cognizant that history is catching up to them, distract themselves with frenetic celebrations and debauchery. Venice is an empire staring down its final days – like a garishly made-up prostitute at the end of a long night staring silently at her reflection, powder caked and lipstick smeared, in the mirror. In Venice, everything is different. Different from what, if not Venice?… A city that shows only one-half of herself, held aloft on millions of felled trees, upon the forests of Istria, the great trunks cut down, dragged, floated, flayed, and sawn into piles, planted in the mud, bolt upright and tarred like mummies, chain-bound oaks, hooped in iron, held motionless in the sand for all ages, doubly dead, etiolated corpses encrusted with lime, dead mussels, putrefied seaweed, swathed in nameless debris, decomposed rags and bones. A twin city beneath the city, inverse replica of its palaces and domes, its canals metamorphosed into the skies of Hades, a response but not a reflection, for this is the city of darkness, the city whose skies are forever black, the city below, on the other side. As Venetian society whirls through candlelit ballrooms they whisper about the trials and tribulations of Count Alvise Lanzi, a hapless Bluebeard, who can’t seem to keep a wife alive. His brides’ untimely ends – punctuated by black bile, violent spasms and agonizing pain – blend together into one macabre death scene which plays across the entire novella. Alleviated only by occasional digressions into the candlelit glamour of Venetian society, the narrative bounces back and forth between an omniscient (if somewhat reticent) narrator describing the evils as they befall the Lanzi brides and a delightfully gossipy correspondent writing to his or her “dear Siren” about all that is happening in the city. The wives, of course, are being murdered. A seasoned mystery reader will suspect by whom very early on, but that isn’t the point. The prose is the star of this dark little book. When Wittkop introduces Felicita and Teresa, two sisters destined to follow Lanzi to the altar and each other to the grave, they are pretty little dolls frozen in a miniature diorama. In just four sentences Wittcop conjures the two young ladies – one regal and serene, the other vibrant and effervescent. But the glamour is fleeting and this image is quickly replaced with another. Death, when it comes, is not pretty or charming. The room, near the kitchens at the back of the Mendicanti, is grayish white like a wall eye. To counter the smell, the pathologists don the old beaked mask once worn by doctors purporting to treat sufferers of the plague. Beside the table, a valet holds the flaming torches. The stench of butchery again, as at the birth. A fly – a fat blue gem covered in fine, downy hair – wanders across Felicita’s face. Back and forth, back and forth Wittkop drags her readers. And, despite ourselves, we enjoy every minute of it. Like her previous novella, The Necrophiliac, the darker and more depraved the story gets the more playful the prose becomes. Much of this little novella’s perfection comes from the cinematic handling of the imagery – cut scenes, close-ups and pan shots, fade ins & outs – it’s very easy to imagine a Tim Burton screen adaptation of Murder Most Serene inspired by 16th century still-life paintings (imagine exquisitely painted depictions of skulls, dead animals and rotting food). The archness of the prose belies the unsavory nature of what it describes. Like the white-eyed, too wide smile of Anne Hathaway’s powdered sugar portrayal of Carroll’s White Queen which leaves the audience unsure of whether she’s going to stroke or snap the fluffy white kitten’s neck, murder has never appeared so charming. Murder Most Serene was longlisted for the 2015 Best Translated Book Award. It’s author, Gabrielle Wittkop, liked to refer to herself as the heir to the Marquis de Sade. 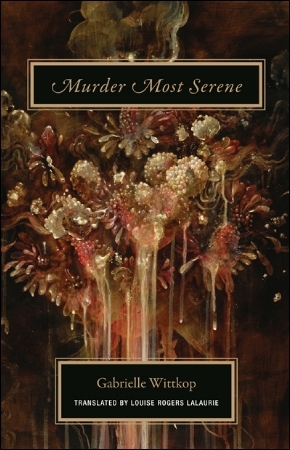 And Murder Most Serene is a book de Sade would have delighted in. A woman of strong principles and beliefs, Wittkop committed suicide in 2002 when she learned she had lung cancer, preferring to meet death on her own terms. Spring Crime Spree! – Betty Boo by Claudia Piñeiro, Miranda France tr. There are three epigraphs at the beginning of Betty Boo, the highly enjoyable mystery novel (her fourth to be translated into English) by Argentine author Claudia Piñeiro. One is a quote from Ricardo Piglia’s Target In the Night. The epigraph is a nod to the sense of unease (a sense that never materializes into the actual paranoia and fear Piñeiro valiantly tries but falls short of conveying) that the murder of one of their own creates among the sheltered residents of an exclusive neighborhood in Buenos Aires – where all who enter and exit the premises (guests, domestics, residents) are closely monitored at the gates. The victim is a rich and influential man and the murder scene staged to appear as a suicide. What makes the events newsworthy is that this man, Pedro Chazarreta, buried his wife five years before under equally suspicious circumstances. He had initially been, and in the eyes of the public remained, a chief suspect in her death. 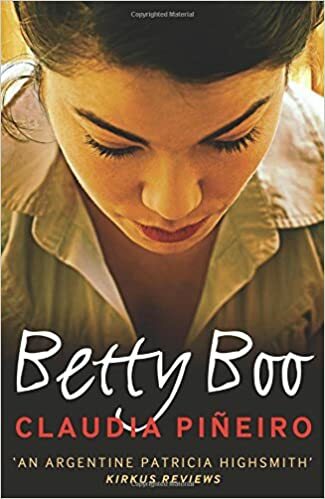 The protagonist and, for the novel’s purposes, lead “investigator” is Nurit Iscar – the titular Betty Boo. Her nickname is inspired by her physical resemblance to the 1920’s cartoon character. Nurit is… rather was… a successful mystery novelist dubbed “the Dark Lady of Argentine literature” up until five years ago (right around the time of the death of Chazarreta’s wife) when a disastrous affair with a married man, her subsequent divorce and a series of scathing reviews of her most recent novel led her to withdraw from the literary world. That last novel had been a departure from the crime stories readers had come to expect from her. She’d written a much more personal work – a love story based on her affair. Since its public rejection she has stopped writing her own material and survived financially by ghost writing the memoirs of society ladies with illusions of grandeur. She is fifty-four and her two sons will soon be graduating from university. She is not unhappy, but has allowed her creativity to become dormant. There is a hole in her life. She is surrounded and sustained by a small group of women friends – all of whom understand this and want her to return to publishing her own work. And so when her former lover approaches and asks her to write a series of columns on the Chazarreta murder for his newspaper Nurit, after some convincing, agrees. She will move into a house in the gated community where the murder occurred. From there she will observe and report on events from the inside, using the proximity to tap into the residents’ paranoia for her stories about the case. As far as an angle goes, it’s a good one. At the same newspaper Jaime Brena, a journalist who sat behind the crime desk for decades, has recently been replaced by a young, wet-behind-the-ears upstart who knows more about social media than about actual reporting. When a call comes about this latest turn in the Chazarreta case Brena grudgingly hands it over. And yet… old habits die-hard and he forms an alliance, a friendship even, with the Crime boy. They – Brena, the Crime boy and eventually Nurit – will come to pool their resources and together attempt to follow the trail of a murderer with a very specific list of victims. Jaime Brena tidies his desk, gathers up his papers, switches off the computer then notices just as he’s about to go that the ruler with which he instructed the Crime boy to simulate his own throat-slashing is lying on the floor under his chair. Jaime Brena has had this ruler ever since he first came to El Tribuno. He has a tendency to form slightly fetishistic attachments to certain objects. He picks it up and puts it back in the drawer. Looking up, he sees that the Crime boy is still working at his desk, and he goes over to him. How’s it going? Fine, says the boy. I’m just finishing up. OK, I’ll see you tomorrow. Jaime Brena starts to walk away but after a few steps he turns back and says: Can I ask you something? Yes, of course, says the boy.Who would you like to be like? What? Says to boy. Who would you like to be like, who’s your role model, your favorite journalist? Ah, from here or anywhere? From here, kid, here, and in Crime, because if you’re going to write about Crime that’s where you need to look for your role model. I don’t know, I’ve never really thought about it. I got into Crime a bit by chance; my role models are in other areas. It shows, kid. Not to bring you down, but it shows. Betty Boo is a better than good book. Piñeiro is a solid storyteller who avoids gimmicks and tricks and instead concentrates on the careful plotting, character development and psychological insight that distinguishes the best mystery writers. Her plot reminds me a little bit of the British writer Anthony Horowitz (who wrote sequels to Sherlock Holmes and James Bond under the auspices of both the Doyle and Fletcher estates). Both authors explore issues and ideas, even politics, but only as far as it serves the story. Their plots are meticulously constructed, built block by block like a case for the prosecution, and frequently stray into lurid (but not ridiculous) territory. As for characters, Piñeiro has managed to populate Betty Boo with multi-generational cast – Nurit, her girlfriends and Brena are in their 50’s. Their thoughts and concerns ring true to their age, as do their actions. And the same can be said for the younger characters, like the Crime boy and Nurit’s sons. They possess the clichéd “arrogance of youth”, but their self-absorption makes them no less likeable. The dialogue is sharp and interesting. Individual voices stand out. Quite an accomplishment, since Piñeiro compresses and contains her dialogue within the same paragraph as the action, abstaining from the use of quotation marks. This simple, little stylistic tick transforms the rhythm of the text into the rapid patter of old pre-code Hollywood movies. These are wonderfully engaging characters who are fun to be around. Their conversations are genuinely interesting, not just for the information, but for their humor and warmth they convey. Claudia Piñeiro’s currently has three other novels translated into English. All three are published by Bitter Lemon Press. None appear to be or have sequels. Spring Crime Spree! – Target In The Night by Richard Piglia, Sergio Waisman tr. When Toni Durán, a handsome Puerto Rican-American, arrives in Madariaga, a small town in the Argentine Pampas, he definitely shakes things up. He romances the beautiful twin daughters of the richest man in town, befriends the local Chinese waiter, charms all the gentry and, a few weeks later, turns up dead under suspicious circumstances. Ricardo Piglia’s Target In the Night seems a straight-forward case of “find-the-murderer”, but soon becomes about much more than solving the mystery of Toni Durán’s death. Luca Belladonna, along with his late brother Lucio, owned the town’s only factory which once employed most of the townspeople. Now the factory stands empty, production stopped by an economic downturn and the death of Lucio in a car crash. Luca has become something of an eccentric, living in the crumbling building with an assistant, continuing to work on his inventions in hopes of re-opening for business. His red-haired twin sisters Ada and Sofia (who can’t help but remind readers of Bolaño’s Garmendia sisters) are beautiful and wild – “The sisters were like replicas, the symmetry between them was so similar it was almost sinister” – and local gossip has both girls engaged in a ménage à trois with Durán, who they met on a visit to the States. He followed them back to Argentina with a suitcase full of money. The Belladonna patriarch is still alive, but estranged from Luca. The siblings’ mothers (one for the boys and one for the girls) are both dead. Piglia’s novel portrays the decaying aristocratic family and all that goes with it: betrayal, disillusion, archaic codes of honor, sexual deviance and the loss of the wealth which buttressed its illusions of grandeur through generations. He has, in short, clothed a Faulknerian tragedy in the guise of a detective novel. By then the story had changed. No longer a Don Juan, no longer a fortune seeker who had come after two South American heiresses, he was now a new kind of traveler, an adventurer who trafficked in dirty money, a neutral smuggler who snuck dollars through customs using his North American passport and his elegant looks. He had a split personality, two faces, two backgrounds. It was impossible to reconcile the versions because the other, secret life attributed to him was always new and surprising. A seductive foreigner, an extrovert who revealed everything, but also a mysterious man with a dark side who fell for the Belladonna sisters and got lost in the whirlwind that followed. The whole town participated in fine-tuning and improving the stories. The motives and the point of view changed, but not the character. The events themselves hadn’t actually changed, only how they were being perceived. There were no new facts, only different interpretations. As every good reader knows, a murder needs an investigator. Detective Croce, a Lear-like figure working from the brink of madness, is determined to discover the true killer and exonerate the scapegoat. A man who has been falsely imprisoned by those who find an expedient solution to the case more politically beneficial than justice. Emilio Renzi, a big city journalist who appears in a number of Piglia’s books and is a satisfactory (and satisfactorily cynical) foil provides the objective outsider’s view of events. They form a dynamic partnership – Renzi the superego to Croce’s ego. Piglia’s work is both clever and unusual. At first glance Target In the Night reads as if it were three or four stories, ideas even, mashed together into one. The transitions between scenes are fuzzy, making the plot difficult to follow at times. The story doesn’t follow the narrative we expect and as a writer Piglia can come across as a bit schizophrenic. But the writing, itself, flows beautifully and the threads sort themselves out by the end. And some of those scenes with the fuzzy transitions between them can be very funny. When Renzi visits Croce in an asylum he gets to know some of the inmates. Ricardo Piglia is an Argentine transplant who now currently teaches Latin American Literature at Princeton University. It might be worth noting that the Belladonna/Garmendia sisters coincidence isn’t the only Bolaño parallel to be found. Piglia incorporates fictional footnotes into his text as well. And while Bolaño doesn’t own the patent on twins and footnotes, they might be something an Argentine author who isn’t specifically intent on paying homage might want to avoid. Sometimes, though, these glimpses of the familiar work in an author’s favor and add to the readers pleasure. Fortunately for the author, they do that here. Target In the Night seems to be part of the ongoing trend towards the domestication of the crime novel. Crime/detective fiction is the one category which (seemingly) has managed to entirely escape the genre ghetto – skipping back and forth across the line between its sensationalist roots and literary aspirations. Latin American authors, in particular, seem to have the most fun with the fusion, injecting a bit more humor, experimental prose writing and unusual story structures into their endeavors. In fact, the defining characteristic of these existential crime novels seems to be exactly how little a satisfactory resolution of the crime actually matters to the overall trajectory of the story.